What was the best gift you got during the holidays? Mine is the one given by my sister, Nica. She knows I like teddy bears. She knows that one of my favorite colors is red. She knows that I like doing stuff in the kitchen. 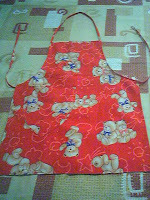 So she gave me a red apron printed with teddy bears. Only she could have thought of that - a simple yet useful gift that would really make me happy.